Soon after Victoria began her career in 1985, The New York Times described her work as "the most cerebral, the one bound to be influential," and the continues to be a major force is the design community. She is coninually featured in such publications as Architectural Digest, The New York Times, New York Magazine, Elle Decor, Vogue, W, Town & Country, Harper's Bazaar and House Beautiful. Vogue exclaimed that she defies the old school implications of the term "lady decorator". 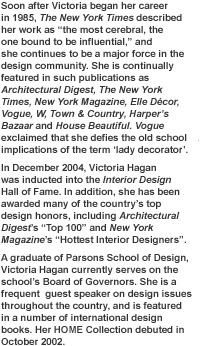 In December 2004, Victoria Hagan was inducted into the Interior Design Hall of Fame. In addition, she has been awarded many of the contry's top design honors, including Architectural Digest's "Top 100" and New York Magazine's "Hottest Interior Designers". 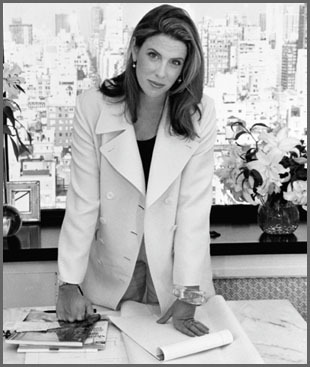 A graduate of Parsons School of Design, Victoria Hagan currently serves on the chool's Board of Governors. She is a frequent guest speaker on design issues through the country, and is featured in a number of international design books. Her HOME Collection debuted in October 2002.